Aim: To increase young people’s knowledge and awareness about climate change issues. 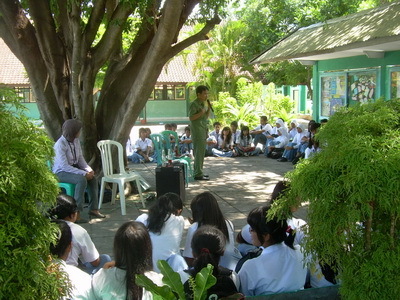 Activity: In 2009, we visited senior high school across Sumbawa District to share about the causes and impacts of climate change, with special emphasis on the impacts for rural areas. Target group: Senior high school students. Around 7 schools were visited (e.g. SMAN 1 Sumbawa, SMAN 2 Sumbawa, SMAN 3 Sumbawa, SMKN 1 Sumbawa, SMAN 1 Lape, SMAN 1 Plampang, and SMAN 1 Empang). Outcome: Increased knowledge and awareness about climate change in rural context. Follow up: Seeing their enthusiasm during the presentation and discussion, Komunitas Penjaga Pulau decided to conduct environmental education for youth with a particular focus on coral reef conservation. Thank you to The British Council Indonesia for their generous support in this project.